I already have a thread about this on BriSkoda, but I thought it might be of interest to some on here, and it could also be a source for ideas and inspiration for me as I look to keep developing it. When I bought this Caddy, it was a mechanically standard 1.9D, which had some time spent on its bodywork, resulting in it looking like this. 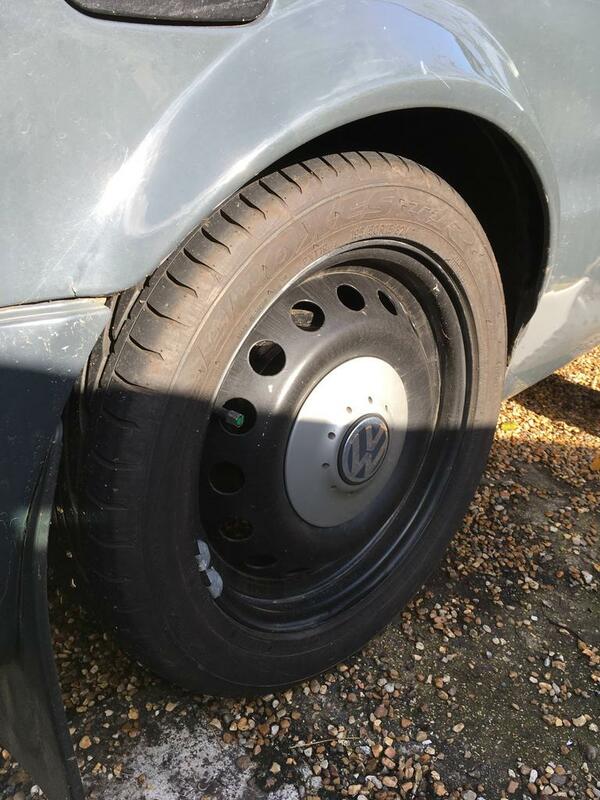 The rear spoiler did not last 24 hours in my ownership, and the white alloy wheels were sold to be replaced by Renault 15" steels, to which I fitted Felicia hubcaps with VW badges. Over the course of the subsequent months, my son and I removed the vinyl wrap, spotlights, bull bar, side window tints, rear window paint (seriously! ), rear step, front splitter, sun strip, and a lot of bright red painted parts from the interior. The registration was put on retention, and I assigned the personal plate I had taken off my Felicia pick-up. Apart from a bit of attention to the electrics, no effort was required to keep it running for the next few months. The cooling was a bit marginal, possibly as a function of the non-standard front bumper, but everything else seemed to work as it should. I had some louvres put into the bonnet, mostly because I want the cooling benefit, but partly also because I like the look of them. The checker-plate load cover was vandalised, apparently by someone who did not realise that the way to get into the back was to open the tailgate! 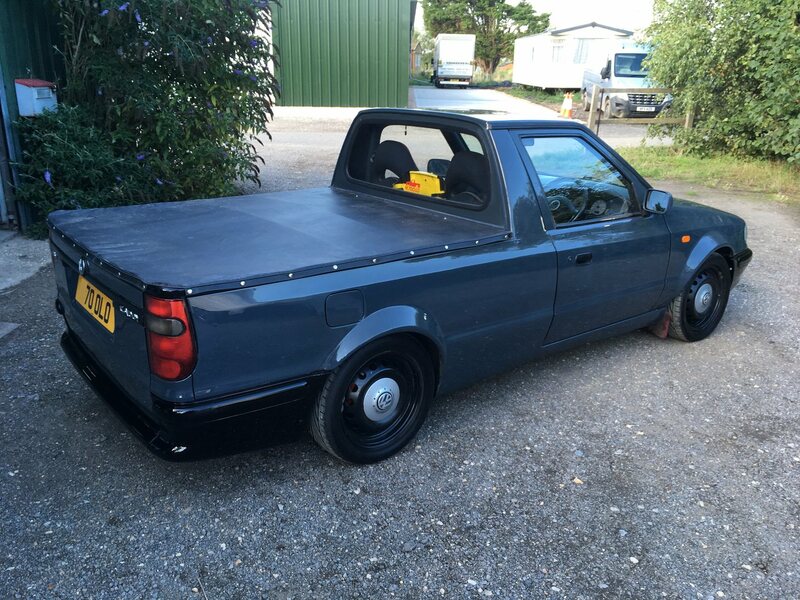 I may replace that at some point, but in the meantime I have fitted a tonneau cover. Fitting the tonneau actually required a trip to the body shop, as when the rigid load cover had been fitted a strip of steel had been welded over the tonneau channel on the cab back. This had to be removed and the channel painted, and I also got the bonnet painted, plus a cut-out made in the slam panel, for reasons which will become clear. Prep work complete, the Caddy, along with my Felicia 1.8T, went to JKM, where Jim and his men set about modding the Caddy chassis legs to take the mk4 Golf mounts, and replicating all of the clever fabrication that TeflonTom on BriSkoda had done on the Felicia, and written about on the associated (and very helpful) BriSkoda Felicia 1.8T transplant thread. Before photobucket decided to be unhelpful, I had made copies of all of Tom's posts (including the pictures) which I sorted into a how to manual for JKM. All the transplant bits which Tom had fitted to the Felicia with a combination of inspiration and perspiration were swapped onto the Caddy without requiring much of either (especially from me). The result is that I now have a Caddy with 1.8T power, which I am most chuffed with. I have to admit to feeling a bit of a cheat, as ordinarily I am a 'built not bought' disciple, but I had to accept that the fabrication involved in this transplant was beyond my level of expertise. Outwardly, the Caddy gives few clues to its potency, with only the side exit exhaust (made for the Felicia by Mike Stokes Exhausts in Bournemouth) really giving it away. I have a very long to do list for this pick-up, but I am not too proud to go for the odd quick win. I am aiming for it to look OEM (maybe OEM+) so I bought a mk4 Golf engine cover to tidy-up the engine bay. 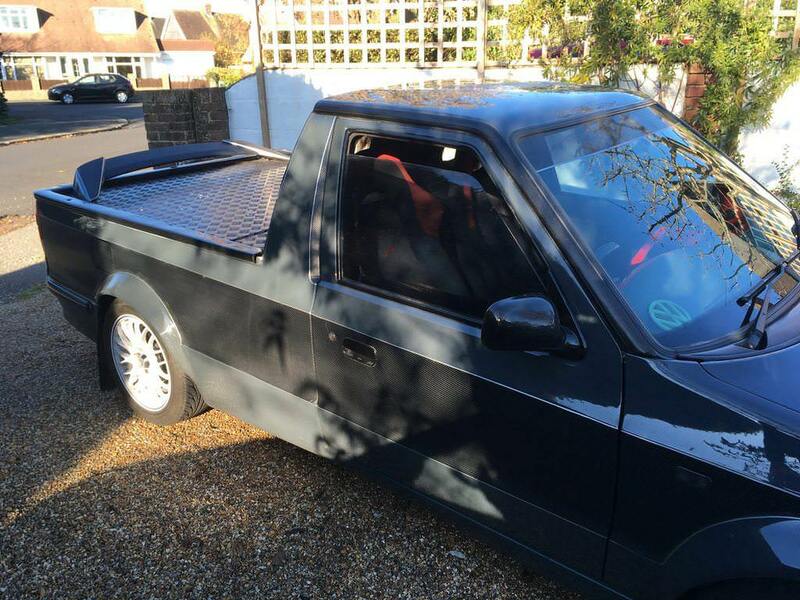 I took another shot of the whole pick-up, this time in more favourable light. From this angle you can see that the louvres look quite subtle now that the bonnet has been painted. The front bumper, which is apparently a mk3 Golf item, is not giving the airflow required for effective cooling, so I will be replacing it with the Felicia one that was previously modified to accommodate the intercooler and pipework. I am not a fan of the current bumper so I am happy to swap it. I have an original grille which will also be fitted, once I have sourced a replacement VW badge for the centre. When I took the Golf front bumper off, the Caddy resembled something out of Mad Max. The crash bar had been mutilated, presumably to enable the non-standard bumper to fit. Fortunately I had the crash bar off the Felicia to replace it. The top bumper brackets had been removed, but I robbed those from the Felicia too. After those and the crash bar had been painted black and fitted, the bumper from the Felicia went on without problems. With the Felicia bumper and a standard grille fitted, the front end is looking much more like it should. 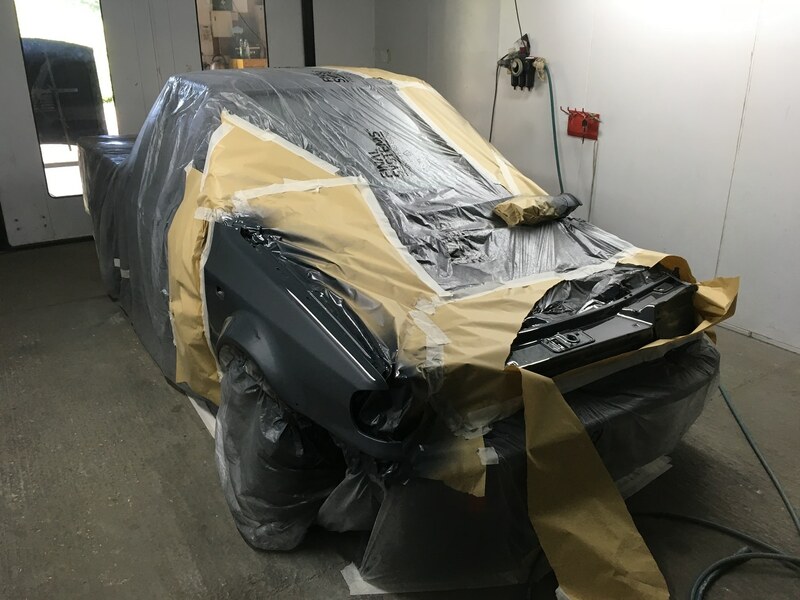 Both the front and rear bumpers will be getting a respray in black at some point, but that is some way off the top of my priorities at the moment. As it is, I am really pleased with the way the front end now looks much more standard. 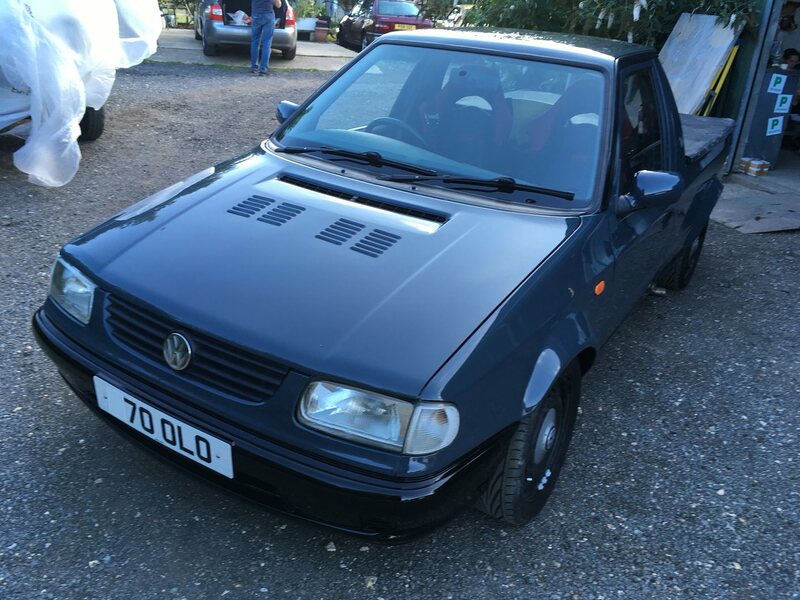 When the engine and gearbox were swapped, the Caddy’s original speedo cable was re-fitted, rather than the Golf item that had been in the Felicia with the same running gear. Initially, it worked OK, but that did not last long. When I disconnected the cable at the speedo end, I found that the inner cable was broken near to the gearbox. Detaching the cable from the gearbox sender was very awkward, even after the air filter was removed and the gearshift cables were moved out of the way. The only way I could get the speedo cable fitting to turn was with mole grips, and the space was so restricted I could only turn it a tiny amount each time before I had to remove the grips and re-position them. When this had been going-on for what seemed like ages, I realised that the cable was still tightly screwed-on to the sender, and it was the sender which was unscrewing from the gearbox. Further faffing about then ensued to finally get the cable off the sender, and the sender back in the gearbox. Fitting the Golf speedo cable was a breeze in comparison, especially at the speedo end, where the extra length of the Golf cable over the Caddy one was a game-changer. When I took it out for a drive, however, the speedo worked for just a few seconds, then stopped. I had the instrument cluster out three or four times trying to get the speedo working again. Having struggled to get the steering column back in position after lowering it to get the instrument cluster out, I decided I needed to make it a bit easier. I bought four M8x80mm bolts, and nuts, and after removing the steering column mounting bolts one at a time I replaced them with the 80mm bolts, with the nuts wound-up to keep the column in position. Once all four long bolts are in place, the nuts can be wound-down by hand to lower the column so the instrument binnacle and surround can come out. To find out if the problem was with the speedo cable, the sender, or the speedo itself, I disconnected the cable at the speedo end (again) and poked it round the side of the instruments so I could see it from the driving seat. I found a piece of heatshrink to push onto the end of the inner cable, so I could easily see whether or not it was spinning. When I took the Caddy out for a drive the inner cable spun, but only momentarily. After pulling-over two or three times to fiddle with the inner cable, I succeeded in getting it to go further into the sender than it had previously. Problem solved. It is probably stating the obvious, but when the steering column needs to be returned to position, the nuts can be wound back up by hand until the column is where it needs to be, then each of the long bolts can be replaced one at a time with the ‘proper’ bolts. It is so much easier than trying to hold the column in place while lining-up the bolts along with the associated spacers, washers etc. When my son took the Caddy out for the first time since the engine transplant, he had only been driving it for about 20 minutes when it cut-out on him. When I saw his name come up on my phone, I feared the worst, so I was actually relieved to be told he had broken-down rather than having pranged it. I need to have more faith in him. When I got to him, the Caddy started straight away, but it only ran for a few minutes before it cut-out again, and so it went on. I called the AA, but by the time the van showed-up the Caddy started and ran fine, so the AA guy just followed me the couple of miles home. When I came to investigate the fault, I discovered that my VCDS laptop could not communicate with the ECU, so I was forced to try to fault find blind. I concluded it was probably an electrical component, and tried swapping-out the ignition amplifier, amongst other things. Nothing I did made any difference to the symptoms of the fault, and actually when it did run it had deteriorated to the extent that it was struggling to rev, and smoking badly like it was over-fueling. I suspected the problem may be with the ECU, but unsurprisingly I had no handy spare, and I did not want to buy one based only on my guesswork, so the Caddy went on the back of a truck to JKM. Jim could not get the ECU to communicate either, whether in the pick-up or on the bench, so he advised that a replacement ECU was the right way to go. I found a seller on eBay who had a good reputation for selling gently (my word not his) re-mapped ECUs, so I ordered one, which arrived at JKM two days later. Once it was fitted, the Caddy ran fine, without signs of over-fueling or cutting-out. A while back I bought an OMP digital boost gauge off eBay. It had apparently been discontinued, so it was pretty cheap, and it struck me as something I may have a use for in the future. The gauge display looked a similar size to the Felicia digital clock display, so I decided to have a go at replacing the clock with the boost gauge. The boost gauge was comprised of two boxes, one containing the sensor, and the other holding the LED display plus the driver circuitry. The display proved to be a perfect push fit into the Felicia clock bezel, although the display box was obviously far too long to fit between the bezel and the PCB. When I prised the display box apart, I found that the display was attached to the circuit board via 13 resistors and one wire link, all of which were soldered at both ends. I cut the display end of the case to length so it would fit between the clock bezel and the PCB. The resistors and wire link were all de-soldered from the display board, and as I did not have any suitably fine wire to re-connect the two circuits I separated the cores from a length of CD changer cable and, as I did not have 14 different colours to tell them apart, I used coloured heatshrink. Once all the connections were made at the display end, I fed the wires through the hole in the PCB where the clock illumination bulb normally goes, and re-attached the clock bezel to the PCB, with the boost gauge display inside it. I then started to solder the interconnecting wires to the resistors on the driver board. This was the point at which I wondered why I had ever thought this was a good idea! After an hour or so of peering through a magnifier to see what I was doing, I had all of the connections made. Much to my relief, when I then connected a 12v supply to the boost gauge, the display all worked as it should. So that I could get the wires through the rear cover of the speedo cluster, I cut the cover from the edge, through a screw hole, and onto the hole originally for the clock illumination bulb. The exposed end of the circuitry is protected inside plastic, and the driver box is cable tied to the rear cover. I wired a couple of 3-way Superseal connectors, one for between the driver box and the sensor, and the other to connect to ignition 12v, earth and display illumination spliced-in to the vehicle loom. Bloody marvellous! Good job on that gauge! Wow, wow, and wow ! Some cracking work here, thanks for the write up! Thanks. The irony is that I don't even like boost gauges particularly, as they are only interesting to look at when things are too exciting to be looking at your gauges. I am pretty pleased with how it looks now it is all sorted, however, although I have now started toying with the idea of doing all the wiring again so I can have a green rather than red display! Thanks Curtis. I will take you out for a spin in it at some point, if you like. Thanks. I have plenty more to write up yet, and loads more plans for this Caddy. I am a fan of additional gauges to let me know more of what is going-on under the bonnet. When I wired oil temperature, oil pressure and voltmeter gauges into the Felicia I just used the obvious individual insulated crimp terminals we all know and love. They did the job perfectly well, but I am OCD about my wiring, and I wanted to do a more professional job this time. I have several sets of VDO gauges and the associated loom that would have been used to connect them in the Audi 80 or contemporary VWs, but neither the Caddy nor my Ibizas have the connectors in their standard loom to allow the gauge loom to plug in. So, I looked at the part number of the connectors (1x 6-way, 1x 2-way) on the Audi loom, and asked various VAG parts people if they could supply the corresponding plugs. No. Obsolete. Couldn’t even give me part numbers. After much searching I found a website with a really comprehensive connector reference section. It was not in English, so I had to trawl through pages of pictures to find what I was after. Eventually I found part numbers for both plugs. After that, it wasn’t hard to find suppliers who could each supply one of the plug types, but they came without terminals. After further searching I found two more suppliers who could each supply one of the types of terminals required. Three weeks later, the parts had arrived from all over Europe. The gauge loom includes the cigarette lighter, so my plan was to unplug the standard cigarette light connector, and add the new loom between that connector on the standard loom and the cigarette lighter socket. This picture shows the Audi gauge loom, with its cigarette lighter socket connector towards the right, next to the Caddy cigarette lighter socket on the right. The Caddy cigarette lighter socket connector was then soldered onto the gauge loom. The battery 12v, earth, and instrument illumination wires that had previously connected to the Caddy cigarette lighter socket were then fitted to the appropriate pins of the new 6-way plug, along with an ignition switched 12v. The gauge sender signal wires were then wired to the new 2-way plug, and from there it was plug and play. These photos were taken before the wiring was wrapped and generally tidied, which I did once I had established it was all working as it should. Under the bonnet I used an oil filter sandwich plate, which had oil pressure and temperature senders fitted already. A 3-way Superseal connector was used to connect these to the signal wires and earth. The plan was to fit the same gauges as I had used in my Felicia pick-up, but despite frenzied searching I could not find them. Instead I fitted another set of gauges which were intended for one of my Ibizas. Although the gauges had been positioned under the dash in the previous pick-up, and had been fine there, I am not really happy with it in this one. Swapping the locations of the gauges and the head unit was soon added to the to do list. 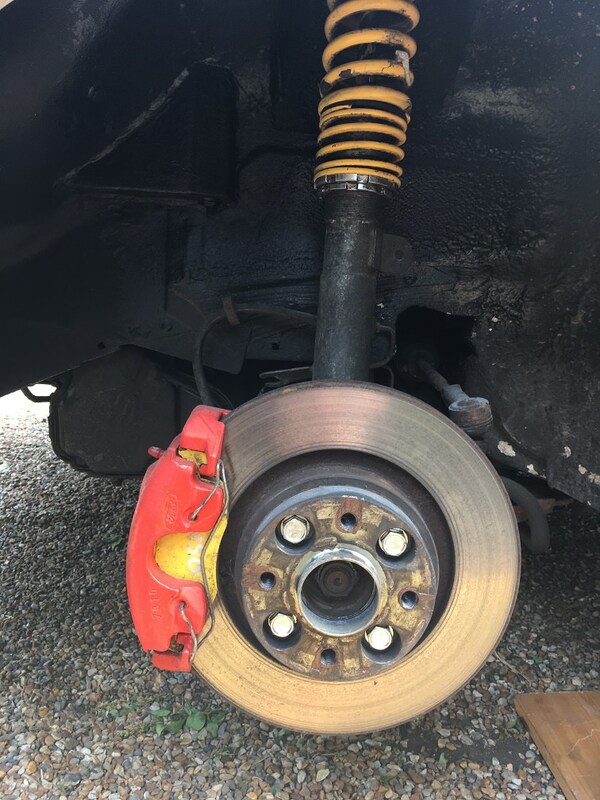 The standard brakes were never going to be sufficient to handle the increased performance, so I robbed the appropriate parts from the Felicia 1.8T to resolve this. 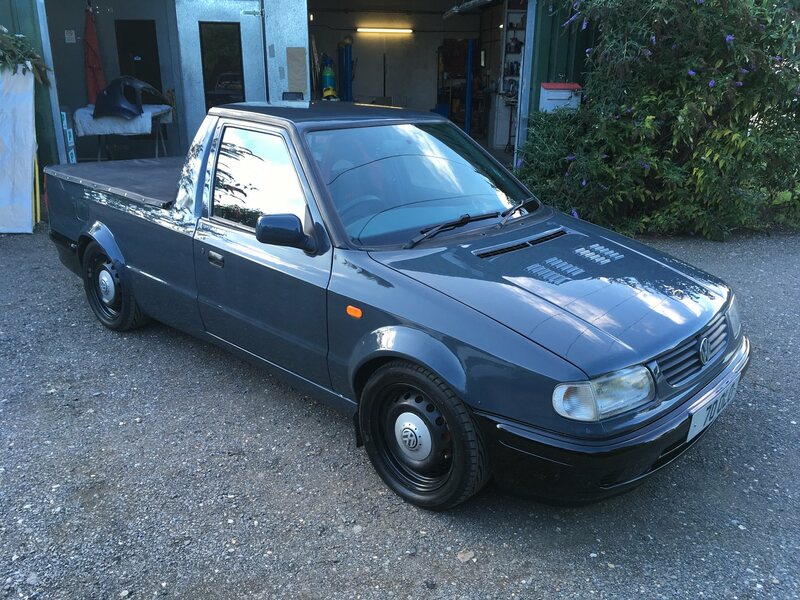 This involved a rear disc conversion using parts very similar to those I know from my SEAT mk2 Ibiza GTi, meaning they are probably mk3 Golf or mk2 Polo parts. When I removed the rear wheels I found 25mm and 5mm spacers fitted. 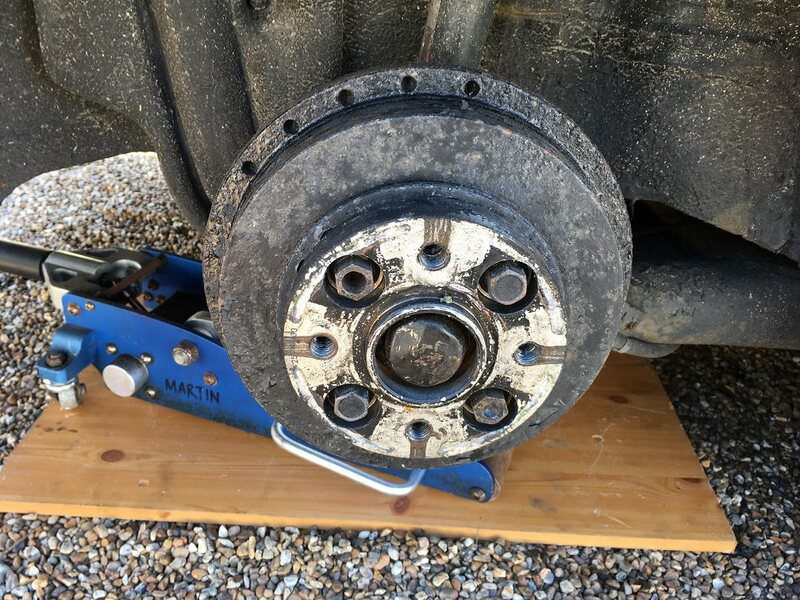 The original bolts for the 25mm spacers had evidently gone missing at some point, and the bolts that had been used to replace them did not quite sit flush with the wheel mating face. I definitely should have noticed that when I had the wheels off previously! I sourced some bolts with shorter heads to use when the 25mm spacers were re-fitted (after the photo was taken). The 5mm spacers did not go back on. The front brakes were a bit more complicated to upgrade. Again, most of the hard work had been done in uprating the brakes on the Felicia 1.8T, and I only had to swap the bits over. 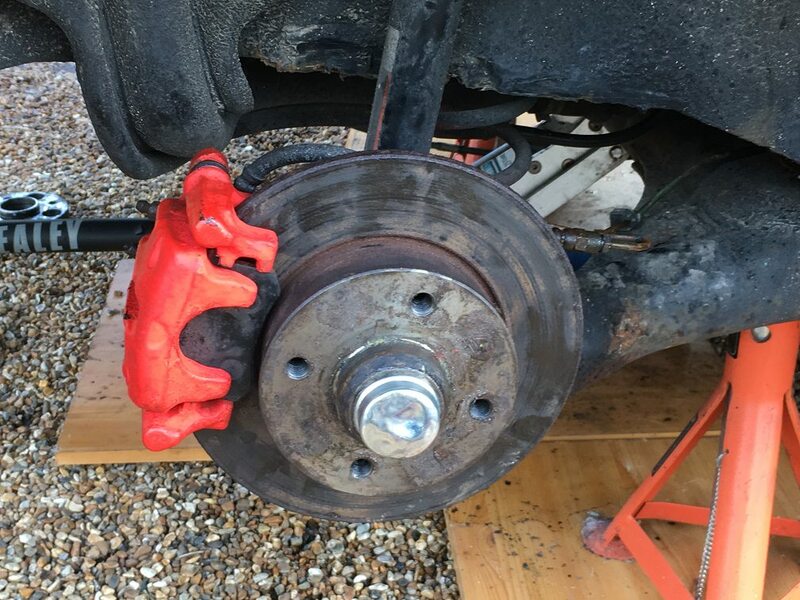 The brakes going on are Golf G60 discs (again, same as mk2 Ibiza GTi parts) with Mondeo ATE callipers. The Mondeo calliper mountings line-up with those on the Caddy hub carrier, but the carrier has to be machined to take the larger M12 bolts. The hub carriers I took off the Felicia had this done, and had been fitted with mk1 Ford Focus coilovers. These coilovers are nasty FK units, and will be swapped at some point, but for now they are on the Caddy. 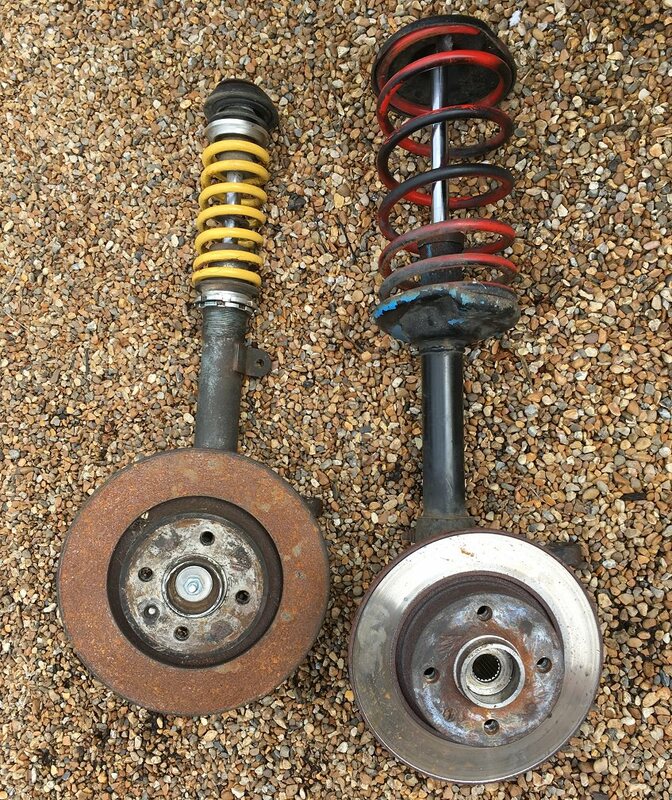 Pictured below are the ‘standard’ front upright and brake, and the replacement with the larger disc and the coilover. The difference in size between the discs is not that obvious in that photo, but when you see the comparison between the pads it is more striking. 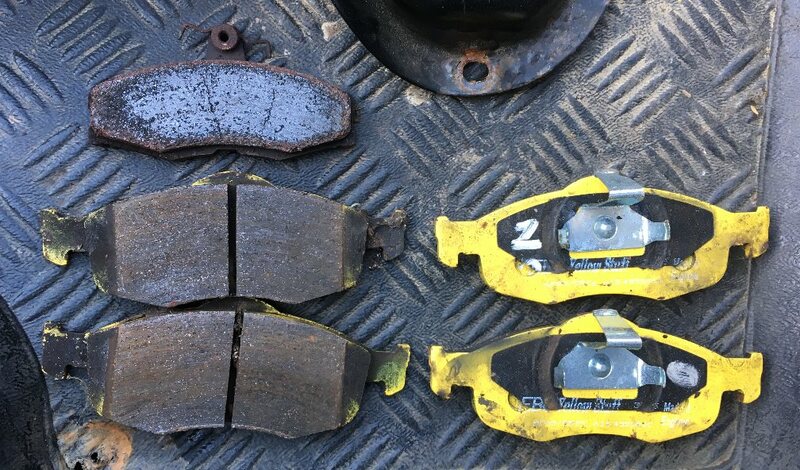 The standard pad is at top left, and the other four are the EBC Yellowstuff pads I am using in the Mondeo callipers. Front upright in place, complete with nice shiny (and shorter-headed) new spacer bolts. Thanks. I cannot claim it is rust-free, the B-pillars, rear arches and rear crossmember are all in need of some TLC, which is planned for early next year. I have to save-up some more pocket money first. As I mentioned previously, with the extra gauges being mounted under the centre of the dashboard, they were very hard to read. The easiest one to see was the one farthest away, which was the voltmeter, and was therefore the least critical of the three. Both the oil temperature and oil pressure gauges spent too much time at the lower end of the scale, for different reasons, so there was clearly room for improvement. The oil temperature gauge was always reading at the lower end of the scale because its range was 60-170˚C, meaning that the normal reading of around 90˚C was close to the bottom. This was easily rectified by fitting a gauge with a range of 50-150˚C. Having never had the oil pressure warning light showing, I had never worried about the reading on the oil pressure gauge, even though it was towards the bottom of the scale. I had to swap out the oil filter sandwich plate because the O-ring had started to leak, and whilst it was out I also swapped the oil pressure sender. I had bought a 0-5bar sender, suspecting that the one that was fitted would be a 0-10bar item, and so it proved. Ironically, now that I have fitted a sender which provides an accurate pressure indication, I have swapped the gauge for one that has no numerical scale, simply because aesthetically it was a better match for the other two gauges I was now using. Having finally located the gauges from my Felicia pick-up, the voltmeter was swapped for the one from that set. The order of the gauges was also reversed, so left to right is now oil pressure, oil temperature, voltmeter. I bought a DIN mounting box to put the gauges in the radio slot, but the box is going to need some Dremel work before it will fit. 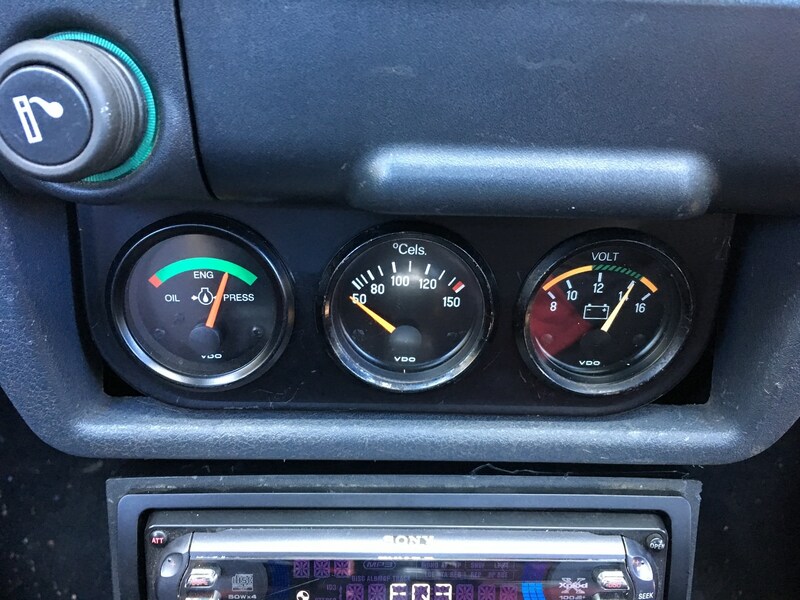 As a temporary solution until I have the time and inclination to sort that, I used the same gauge panel as had been mounted under the dash, but hung it on the bar at the top of the radio slot, held in by the ash tray and 12V socket. The head unit in the Caddy is a fairly ancient Sony CD player. It hardly ever gets used, so the quality of it is not a priority for me. I had a box specifically for mounting a head unit under a dashboard, but it was too wide for the centre part of the Caddy dash. I struggled for a while to find a solution, before I had a brainwave. The box that the head unit cage fits into is held into place by two screws up from under the dash into spire clips (U-nuts) on the bottom of the box. By turning the box upside-down under the dashboard, I could put the same screws through the holes in the dash from inside the head unit slot, and screw them into the spire clips now on top of the head unit box. I will put some sort of centre console around / under it at some point, but it does not look bad as it is. I had a prang in the Caddy back in April. The front end had been looking a bit sorry for itself in the aftermath, although my preferred bodyshop managed to fit it in to get it looking more Caddy-shaped and get me back on the road, it had to go back for paint a couple of months later. 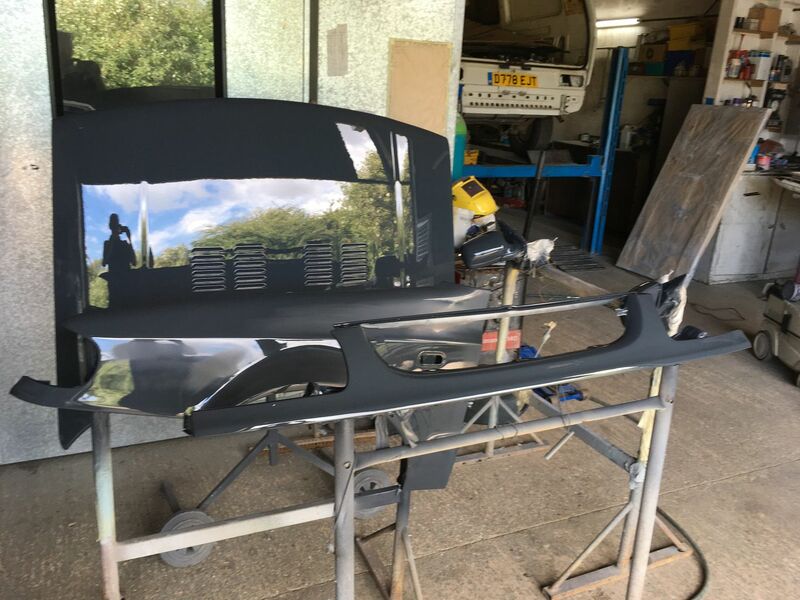 As well as painting the panels that had been damaged in the crash, they also tidied-up a few other bits that were looking tired, painted the mirror covers which were previously a different grey, and painted the front and rear bumpers in gloss black. The former owner had matched the bumpers to the grey of the bodywork, but like a lot of the visual changes he had made, that was not to my taste. I considered doing the bumpers satin black, but decided to go the whole hog and go for full gloss. I am really pleased that I did.